Recently I entertained at the 60th class reunion of Weequahic High School. I’ve played for all ages, from baby namings and christenings to 90th birthday parties. But there is a special kind of good feeling when old friends, some of whom have not seen each other for 10 or more years, get together. I shouldn’t use the word “old.” These were very young and spry individuals. 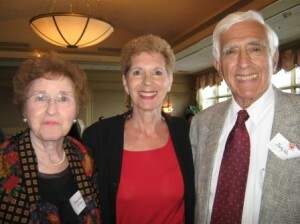 The reunion took place at Cedar Hill Country Club in Livingston. My contact was Nancy Evans Herman, a member of the class of 1949 whom I had met, with her husband, years ago while playing at Nordstrom at the Short Hills Mall. I actually played for Mr. Herman’s high school reunion a number of years ago! I must thank Nancy; it was her idea for the reunion committee to hire me to entertain at the event. I enjoyed meeting committee member Morty Weinstein. A few weeks before, Morty called me and suggested a few particular songs for me to play and sing – some “oldies” like “Unchained Melody” and “As Time Goes By”. And of course, as always happens, several other attendees came up to me at the piano to request songs. It is always such a pleasure to play requests, wherever I’m performing. I know these particular songs triggered some happy memories from decades ago. During musical breaks, a few reunion attendees were asked to come up and share their memories of being at Weequahic in the late 40’s. One gentlemen remembered a particular teacher and her unique way of cajoling the students to be quiet. “Do you remember what she used to do?” And of course they all did remember. She threatened to jump out of the window, if they didn’t behave! I wouldn’t recommend that threat these days. What a great time we all had, including myself!